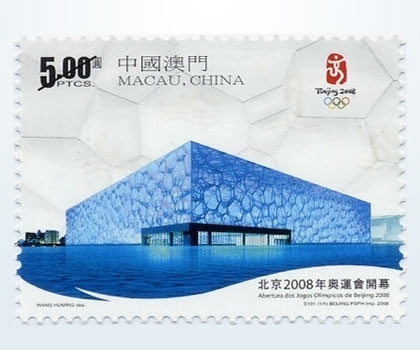 In celebration of the 29th Olympic Games to be held in Beijing, Macao Post will issue the stamp issue “The Opening of the Beijing 2008 Olympic Games” on the date of opening ceremony at 8th August, 2008, in commemorating the successful achievement of this prestigious sport event in the world. 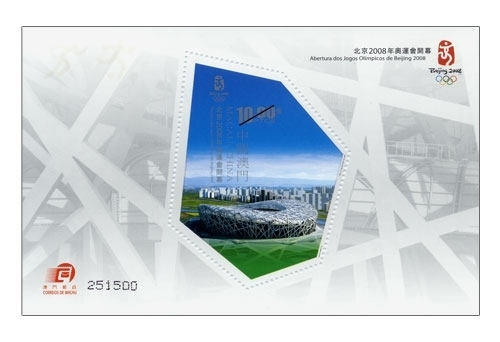 To cope with the opening ceremony held in the National Stadium, the image of “Bird’s Nest” is shown on the souvenir sheet, and the National Aquatics Center “Water Cube” is shown on the stamp. 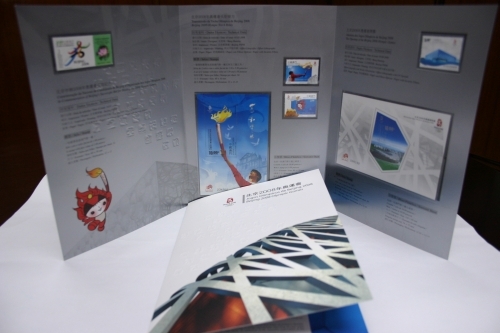 The stamp and souvenir sheet are applied with the printing feature of UV varnish to enhance the pictograms of the Beijing 2008 Olympic Games. 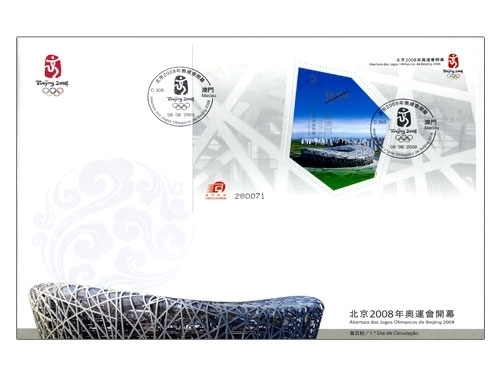 Besides the above philatelic products, the thematic pack with the theme “Beijing 2008 Olympic Games” will also be released. 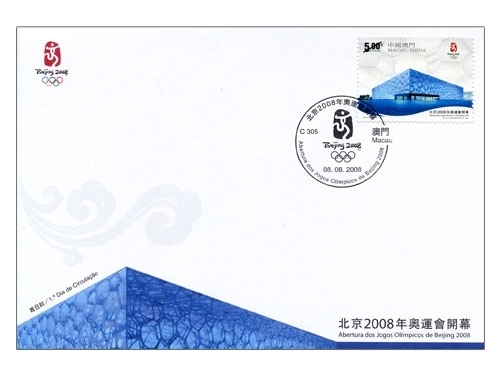 This pack comprises one stamp and one souvenir sheet for the above issue, and also the two stamps and one souvenir sheet of “Beijing 2008 Olympic Torch Relay” issued on 3rd May this year and one stamp of “In Commemoration of Beijing’s Successful Bid for Hosting the 2008 Olympic Games” issued on 14th July, 2001, this pack is priced at MOP68.00. 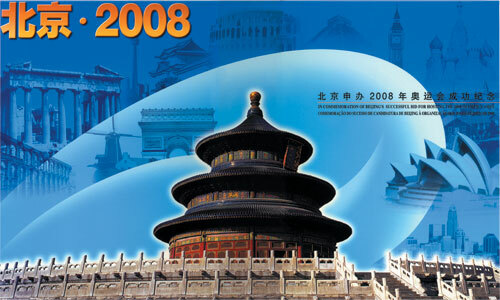 This is the eighth issue in 2008. 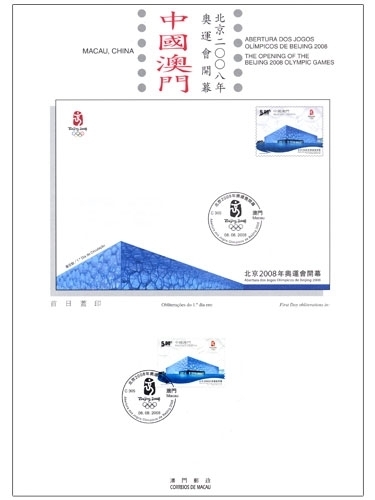 The issued stamps are as “Lunar Year of the Rat” on 23/01/2008; “I Ching, Pa Kua VI” on 01/03/2008; “Beijing 2008 Olympic Torch Relay” on 03/05/2008; “Legends and Myths VIII” on 02/06/2008; “Local Delights” on 04/07/2008; “World Heritage (Definitive Stamps)” on 31/07/2008 and “World Heritage (Label Stamps)” on 31/07/2008. 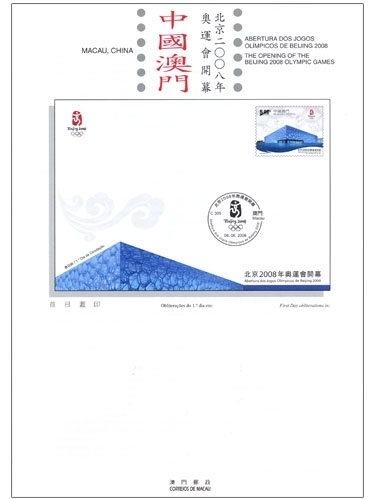 In celebration of the Beijing’s successful bid for hosting the 2008 Olympic Games, Macao Post had jointly issued a presentation pack with State Post Bureau and HongKong Post on 14th July 2001, with the theme of “In Commemoration of Beijing’s Successful Bid for Hosting the 2008 Olympic Games”. 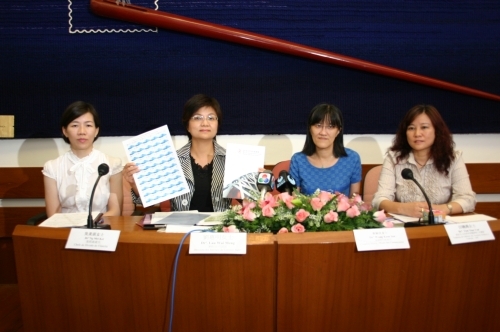 The pack includes one stamp sheetlet of 3 parts joint issued from the three postal administrations, and is priced at MOP75.00. 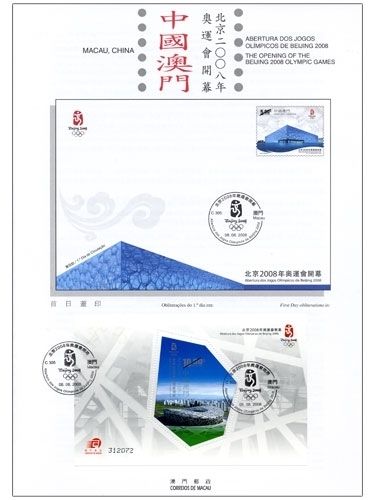 To cope with the new stamp issue “The Opening of the Beijing 2008 Olympic Games”, Macao Post will be further put on sale this most precious collectable joint stamp pack on 8th August 2008 at the Philatelic Shop of Macao Post Headquarters, “Rua do Campo” Post Office, Maritime Ferry Terminal Post Office, Airport Post Office, and the Communications Museum. Limited quantity! Get the opportunity to add value to your collection! To welcome the Beijing 2008 Olympic Games, Macao Post will jointly organized the philatelic exhibition with the Hong Kong Science & Arts Exchange Center, with the theme of “Stamps Collections of Olympic Games”, from 8 to 24 August 2008 at the lobby of Macao Post Headquarters. 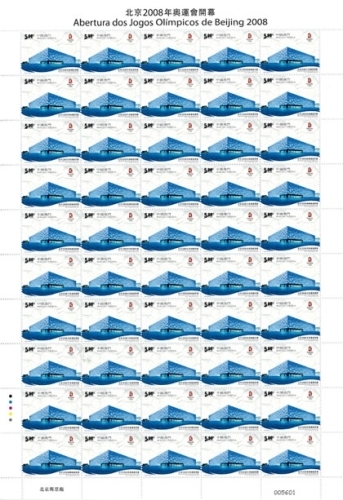 During the exhibition, the philatelic products with the Olympic theme issued by the other postal administrations in the past will be displayed, which included the full set of stamps issued by Greece in the year of 1896, 1960 and 2004, the stamps and souvenir sheet issued by Japan in 1964, etc, and all the Olympic philatelic products issued by Macao Post will also be displayed.